Welcome to the magic show that is healthcare design. And the ticket cost is eye watering. The recently-completed Royal Adelaide Hospital is reported as the most expensive building in the country, coming in at $2.4 billion. That’s more than Canberra’s Parliament House, but then again, expectations of productivity are far higher with a hospital. The driving force behind the visual domain of healthcare is entirely psychology driven. From colours, textures, and way finding to light sources and access to fresh air, the needs of the customer (which includes staff, patients and family) are complex and demanding. Not surprisingly, colours in healthcare have an important role in scene-setting and mood altering. Dulux paints has created a comprehensive range of colour palettes for just this market, from behind the scenes needs such as operating theatres to waiting rooms. Using the right colours is hardly new as a concept, what has changed in more recent design is the combination of colour, texture and materials. 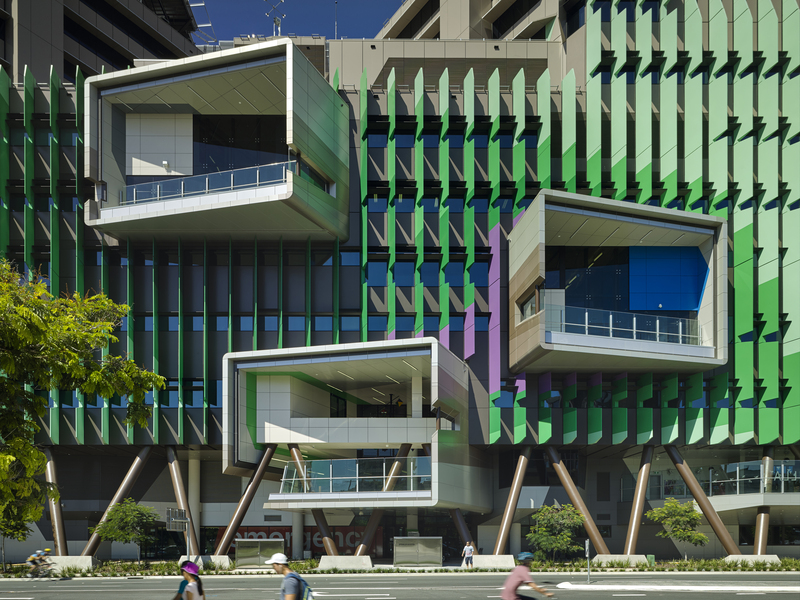 A trail blazer in healthcare design has been the Lady Cilento Children’s Hospital in Brisbane. The specialist paediatric teaching hospital was completed by architects Conrad Gargett in 2015 and is recognisable across the city by its bright green, cheerful façade. It is here the ‘hospital as a tree house’ concept begins; once inside and the massive central void is criss-crossed by ‘branches’ that radiate from the atria ‘trunks'. Enormous, vibrant bird sculptures perch in the voids and at not one but at twelve levels marvellous outdoor spaces and gardens are found. Designed by Katherina Niebler-Walker, the terraces allow light and living colour to interplay with the hard architecture. It is all designed to free the mind, and often the bodies, of institutional albeit medical, detention. A sense of space, of freedom is a frequently a casualty in the healthcare industry – yet there has to be order and clarity in spaces that deal in health care, whether a dentist office or a level six hospital. For retaining the sense of space, while still defining functionality, glass is the go-to medium. A space-age example can be found in the Netherlands, where Studio Prototype designed a complete building for an orthodontic practice. Ortho Wijchen broke down a number of design mainstays by using simple half panels of glass between suites, and allowing the entire common wall of the building, which faced the five procedure areas, a view of a green field. More than a view, the walls actually opened up a whole new take on designing for medical practice which resulted in Studio Prototype being nominated in 2017 for an ArchitizerA+ award in Healthcare and Wellness. Glass is the ideal material for so many reasons and an equal number of applications. What is now changing is how it is being manipulated using old and new technologies. Kristen Altamura is with Exposure, a company that designs and creates architectural glass panels. “We sandblast directly onto the glass,” says Altamura, which is a point of difference in a market where coloured films and decals are often simply adhered to glass panels. The longevity and durability of glass artwork is advantageous in a healthcare setting where equipment is often an abrasive, and of course the material is easily cleaned. Exposure, the largest sandblasting unit in Australia, can print panels up to 3.6m x 2.4m and can create images using colour, in much the same was as those that created early etchings. For those with concerns about glass panels and safety, Altamura points out that the glass can be strengthened using standard laminating techniques resulting in a toughened sheet. But really the product is about beauty, and unlimited graphic potential. The company is currently working on a large project for a Geelong aged care facility that will illuminate the lobby, featuring an aboriginal design.